Low temperature hot water biomass boilers (those operating at up to 95 °C) can be classified by various methods based on fuel type or the physical characteristics of the boilers. Pellet boilers range in size from a few kilowatts (kW) to megawatt (MW) units for district heating systems. Automatic hopper-fed fuel systems are usually used with these boilers. The hopper can be either built-in, in the case of some smaller systems, or a separate unit. Of the biomass boilers, pellet systems are generally the most responsive to heat demands, have the simplest controls and are the closest to fossil fuelled boilers in terms of maintenance and operating intervention, although there can be large variations between systems from different manufacturers in terms of sophistication and features. Pellet boilers can be operated with or without a buffer storage tank, this is dependent on manufacturer and design. Wood pellets are formed by hot extruding compressed sawdust produced during the working of natural dried wood. Not all pellets are produced to the same high quality and we would always recommend using the highest quality pellet. Fuelled by wood chips, which can be supplied with moisture contents from 15% to 50%, these boilers use a stoker burner or an underfed stoker for burning fuels between 15% and 30% moisture content, or a moving or stepped grate system for burning fuels up to 50% moisture content. Sizes range from 40 kW to power station sized boilers of 100 MW and more. Boiler responsiveness is determined partly by the fuel moisture content which the boiler is designed to accept; in general the wetter the fuel, the less responsive the boiler. Wood Chip Boilers are generally more cost effective then Pellet Boilers from 100kWth upwards and are particularly well suited to large commercial installations, district heating systems and agricultural applications. Wood Chip boilers can be operated with or without a buffer storage tank, this is dependent on manufacturer and design. Grown on a sustainable basis, wood fuel/chip can be harvested as part of a constantly replenished crop, this is undertaken by woodland management or coppicing or as part of a continuous programme with the new growth taking up CO2 from the atmosphere at the same time as being released by combustion of the previous harvest. Willow is the predominant species for coppicing or SRC (short rotation coppice) and is used as wood chip within commercial installations and large scale power stations. Both planting and harvesting the wood fuel crop is straight forward. Harvesting is best balanced by dividing the coppice into four workable sections one year after planting to produce a four year cycle of coppicing, producing log sizes up to 2 to 4 inches in diameter, so no need for splitting. Timber felling from woodland management can vary from simple on farm procedure using existing equipment or at the other end of the scale mechanised harvesting and forwarding in large commercial forestry. The logs or timber heaps should be seasoned until they are around 30% moisture. The timber will not need to be stored under cover, but an exposed location where there is plenty of wind and sunshine is important. It is also important to store the logs on bearers, or dry hard standing, so that they do not absorb moisture from the ground. Log boilers are fuelled with logs and larger pieces of wood, including joinery offcuts. Wood is manually loaded into the appliance, making them suitable for houses or small commercial applications where labour is available. 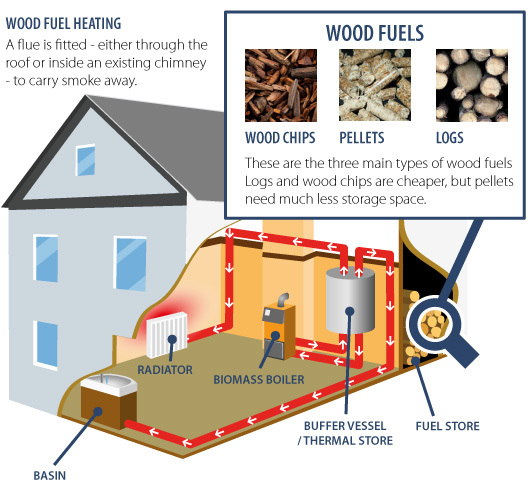 Log boilers are batch fed devices and simple to operate, but they require a large water storage cylinder (thermal store, accumulator or buffer tank) to capture the heat produced, and a managed wood store. Log boilers operate using the heat which is produced during combustion to heat the cold water which is then transferred to and stored in buffer storage tanks. The domestic heating system will then draw the heat from the buffer storage tank as required. Once the buffer storage tank has typically dropped to circa 45⁰C the system will require a further combustion cycle by way of loading the Log Boiler with further logs. Logs generally need to be cut to specific lengths to fit within the chosen Log boiler, the more accurate the cut and fit will result in maximising the combustion cycle from a batch burn.